Feb 2019: For his ‘leadership and technical contributions to optical metamaterials and nanophotonics’, Prof. Zheludev has been elected as a Foreign Member of the US National Academy of Engineering (NAE). The NAE was founded in 1964 to advance the well-being of the nation (the USA) by promoting a vibrant engineering profession and by marshalling the expertise and insights of eminent engineers to provide independent advice to the federal government on matters involving engineering and technology. It is part of The National Academies of Sciences, Engineering, and Medicine, and operates under the same congressional act of incorporation, signed by President Lincoln, that established the National Academy of Sciences in 1863. Election to the NAE, by one’s peers, is among the highest professional distinctions accorded to an engineer. 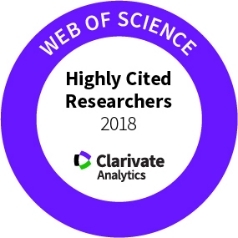 The Highly Cited Researchers list from Clarivate Analytics identifies scientists who have demonstrated significant influence through publication of multiple highly cited papers - ranked in the top 1% by citations for field and year in Web of Science - during the last decade. May 2018: In recognition of the extensive role that he has played in advancing the field of photonics research, Prof. Zheludev has been elected as a Fellow of the Royal Society. April 2018: The European Research Council (ERC) has awarded Prof. Zheludev a €2.57M Advanced Grant to investigate the generation, detection, and interaction with matter of ‘flying toroids’ - a type of light pulse never experimentally studied before. Advanced Grants provide long-term funding for ground-breaking, high-risk projects, offering unrivalled freedom to develop an area of research without predetermined priorities, and are among the ERC’s most competitive and prestigious awards. 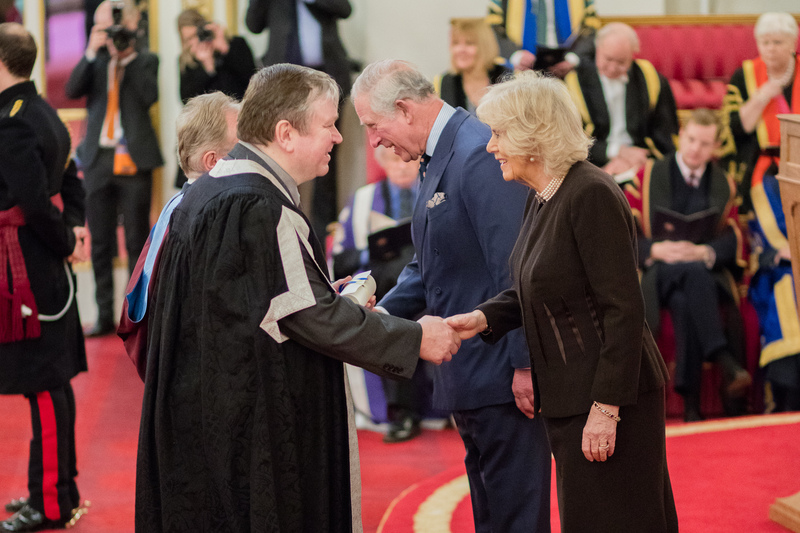 Feb. 2018: In recognition of its world-leading expertise in photonics and fibre optic technology, the University of Southampton has been awarded the Queen’s Anniversary Prize for Higher and Further Education. 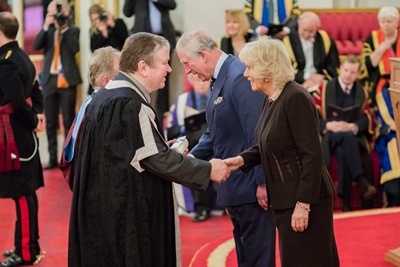 The prize - representing the UK's most prestigious form of recognition for an academic or vocational institution, with approval directly from The Queen and Parliament – was presented by HRH Prince Charles and HRH the Duchess of Cornwall to Prof. Sir David Payne and Prof. Nikolay Zheludev from the university’s Optoelectronics Research Centre in a ceremony at Buckingham Palace. The UK’s Engineering and Physical Sciences Research Council (EPSRC) has announced that the University of Southampton will lead a six-year research programme, from Oct. 2015, on THE PHYSICS AND TECHNOLOGY OF METADEVICES & METASYSTEMS. This multidisciplinary programme will aim, through better understanding of the new physics of advanced materials structured on the nanoscale, to explore technological applications of photonic metadevices, particularly in telecommunications system applications. The programme, directed by Prof. Nikolay Zheludev, will bring together research groups from Southampton’s Optoelectronics Research Centre, School of Chemistry, and School of Physics & Astronomy, and Heriot-Watt University’s Photonics & Quantum Sciences Institute. It is supported by international academic partners from Nanyang Technological University in Singapore and the National Taiwan University, and by industrial partners Dstl, Oclaro Technology Ltd., BAE Systems plc and Ilika plc. "Metamaterials: Optical Properties on Demand"